If you're on the internet, you might have been introduced to the above video of two guys freaking out about a sunfish they've spotted near Boston. If you haven't watched it, it's lovely for a few reasons but also not exactly safe for work (the cursing is epic). One of the reasons I was so excited when viewing it was that one of the first reactions is to "call the aquarium." I study the interaction of aquariums with the public and it's great to see that people see what they think is either a new creature or an injured creature and want to call their local aquarium. The narrator goes on to say he wanted to take the fish into shore alive, but quickly found that it wasn't going to happen- it was so heavy that the drag created from the boat basically killed the poor thing (if the harpooning and gaff through the mouth and eye socket weren't enough). While there wasn't a big enough scale the weigh it when they did get to dock, they did measure its length. 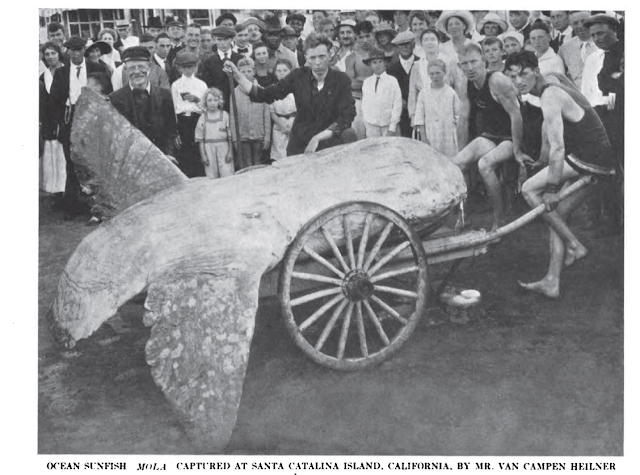 The sunfish ended up measuring 10 feet 11 inches. The sunfish in this narrative was doing the same thing that the one in the above video is doing: basking on the surface of the water to get warm after diving to great depths (go here to read more about it). They are found throughout the ocean and there are often sightings similar to the one in the video (minus the freaking out and Boston accent). We should never forget that the history of marine animal sightings is usually peppered with men on boats screeching "What's that?! Let's kill it and find out?!" However, we should be happy that the first reaction this time around was 'let's help it' and 'let's call the aquarium.' That seems to be progress, even if it devolves from there.